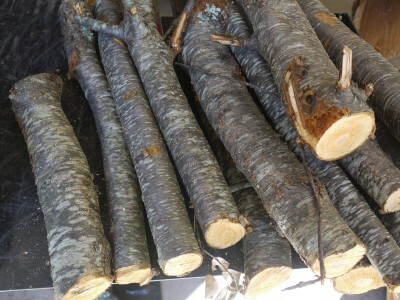 The Black Cherry Tree is a tree native to eastern and southern North America and is most widely known as a timber tree with its hard, strong, close-grained wood. 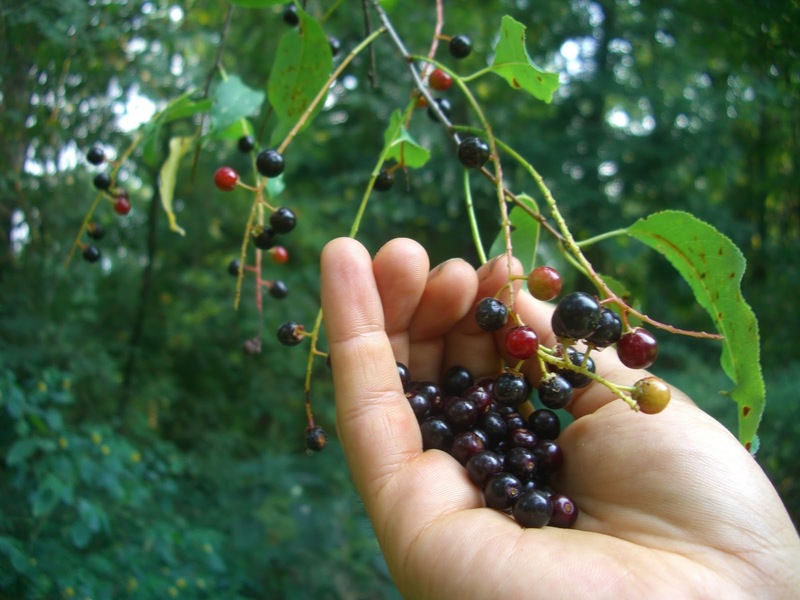 However, it is commonly used for for the flavor of its small (less than 1 cm), dark purple-black berries produced on long, fragrant racemes (a shoot with dozens of flowers) that will then develop dozens of fruit. 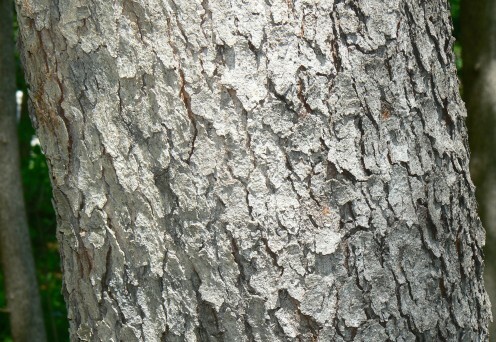 The trees have characteristic bark, smooth and horizontally striped when young and fissured and scaly when over ten years of age. When I lived in Kentucky, we lived on the edge of a farm field. The edge was full of Black Walnut and Black Cherry Trees. One summer I went out and collected a few pounds of black cherries and made black cherry jam. I had never made preserves of any sort, and in fact this was one of my first activities in the realm of “homesteading”. The jam turned out great, and I have been a huge fan of Black Cherry Trees ever since. Almost ignored by cultivators of fruit trees, the Black Cherry Tree has minimal written history. It was used by Native Americans as a food source (a key ingredient in pemmican, a mixture of dried fruit, fat, and meat, and eaten on trips and in winter) and as a medicinal plant used to treat a number of respiratory and gastrointestinal issues. The short storage and absence of super sweet flesh of the fresh fruit, combined with the poisonous seeds and leaves, have likely been to blame for this tree being largely overlooked by plant developers. 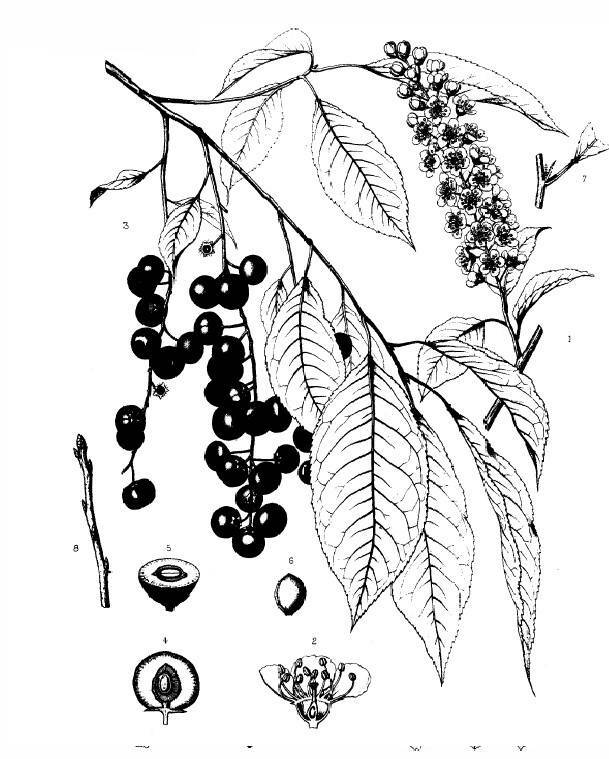 The oldest documented Black Cherry tree is in the U.S. and was 258 years old. Black Cherry Trees are host to a large variety of caterpillars. It has been very invasive in Europe where it was used as an ornamental and unique fruit tree. 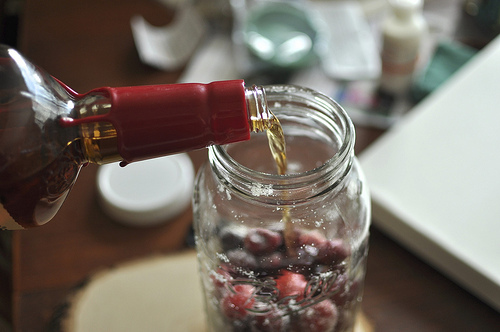 Making some modern-day Cherry Bounce – they are cheating and using store bought cherries! Yield: Good crops occur every 1-5 years. No definitive quantities are defined. The beautiful and fragrant racemes covered with dozens of flowers. 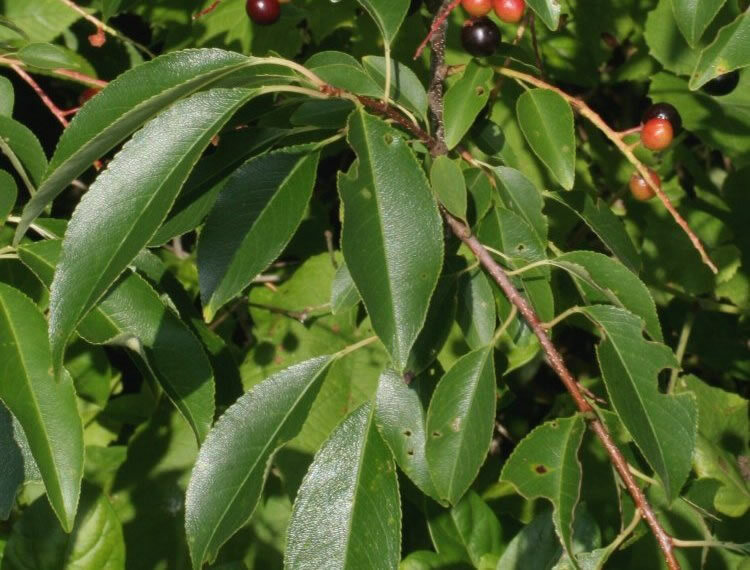 The leaves of the black cherry tree are glossy and lightly toothed. 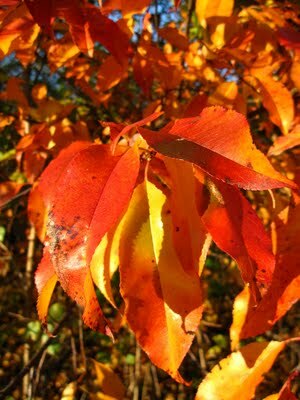 Beautiful orange and yellow of Black Cherry leaves in autumn. 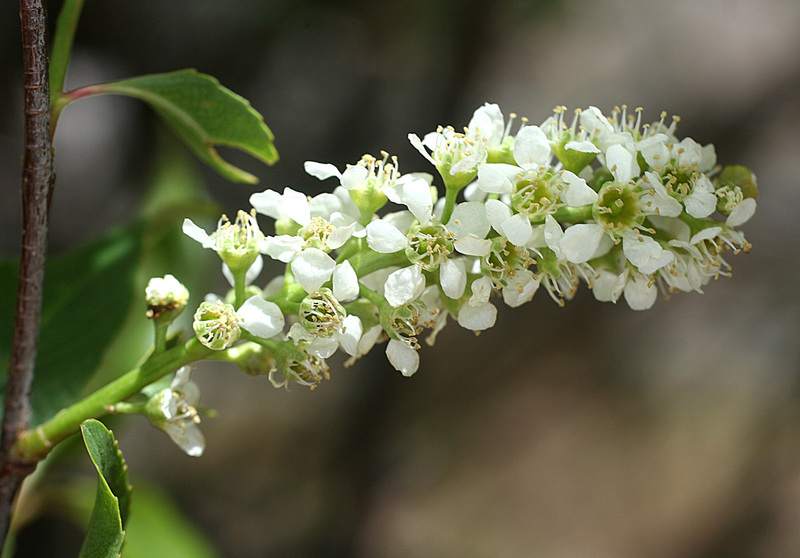 Although minimal scientific studies, Black Cherry likely tolerates juglone (natural growth inhibitor produced by Black Walnut and its relatives) as it is often seen growing in close proximity. Consider using this tree as a buffer between your walnuts and other plantings. Propagation: By seed. Requires cold stratification for 3-4 months. Can be propagated by cuttings. Can spread rather easily by seeds. Seeds can live for 1-3 years before germinating waiting for optimal conditions. Black Cherry Trees are a natural host for the Eastern Tent Caterpillar and Cherry Scallop Shell Moth which can defoliate trees quickly. This can be deadly for young trees, but is usually rarely significant with established, older trees. 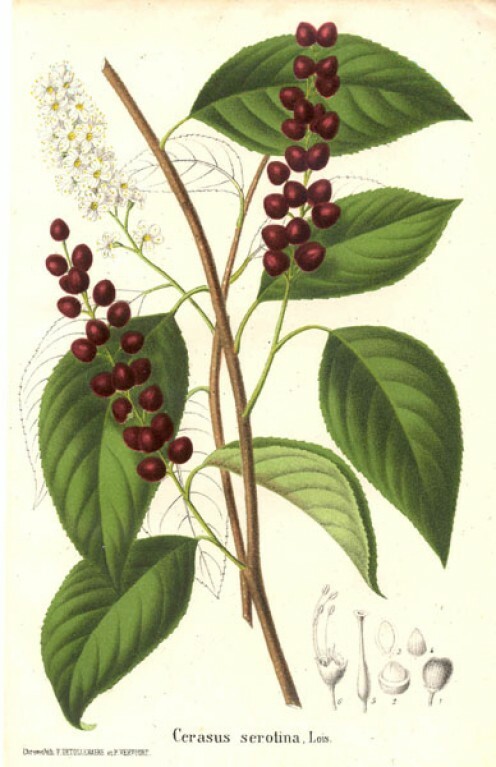 Chromolithograph of Cerasus serotina (older scientific name for Black Cherry, Prunus serotina) by F. de Tollenaere & P. Vervoort in Jacques douard Morren, ed.